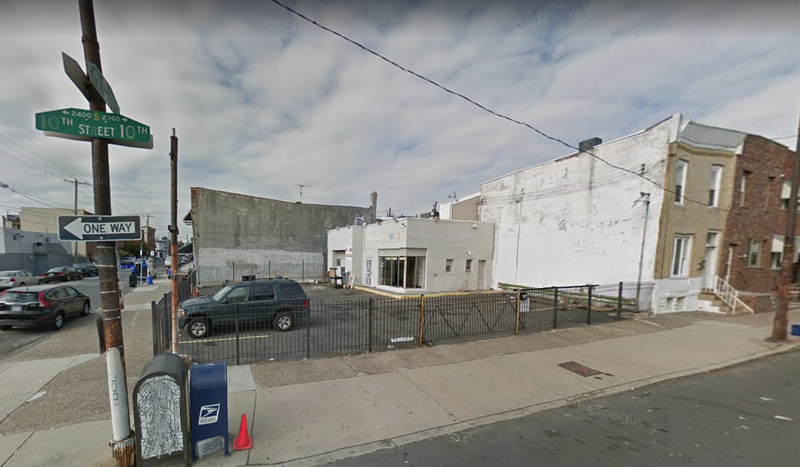 New developer plans to build 12-unit apartment in space formerly occupied by auto-repair shop. Residents of the Lower Moyamensing Civic Association recently convened at Fumo Family Library to discuss potential development ideas for the property of 2342–50 S. 10th Street — a 4,096-square-foot lot located at the intersection of 10th and Ritner streets. The property, which was home to an auto-body repair shop from the 1960s through 2018, was recently purchased by developer Zhibin Tang for $375,000. Tang intends to build multi-family apartment units in the space that is currently zoned as CA-1, or auto-oriented commercial use. During this week’s meeting, LoMo’s zoning committee invited Tang to consider the ideas of South Philly residents about alternative uses for the lot, including single-family homes, parking garages and green spaces. Although the gathering was not an official zoning meeting, Tang presented his current blueprint for the 12-unit project, which includes a four-story structure with four two-bedroom units on three floors, averaging about 800 square feet per unit. The first floor would be designated for 12 parking spots with an 18-foot exit and entrance driveway facing Ritner Street. Considering the recent influx of younger populations in the Lower Moyamensing boundaries, which covers Broad to 7th streets and Snyder to Oregon avenues, several meeting attendees vouched for the construction of four to five single-family homes — a type of housing that already comprises the majority of the neighborhood. Keeping in mind millennial demographics seeking to start families in South Philadelphia, single-family homes could offer the best advantage to the growth of the area, they argued. Continuing support for single-family homes, some individuals vouch that the potential presence of these new homes will significantly increase the average value of Lower Moyamensing homes. According to Realtor Chris DiBiase, the average price of a home around 7th and Jackson streets is about $268,000. He says the addition of four single-family homes at 10th and Ritner streets could bump this median value up to about $278,000. However, others expressed concerns about the construction of both houses and apartments in the space. Some vouched for the implementation of a green space, such as a dog park or playground, especially considering the limited amount of greenery around Lower Moyamensing. Regardless of what will occupy the property, the applicant will most likely seek approval for variances by LoMo’s zoning and planning committee and ultimately the Zoning Board of Adjustment, since the lot is currently zoned as CA-1, or auto-oriented commercial, which generally sustains small-scale shopping areas. The official LoMo zoning and planning meeting regarding the space, which will include a vote, is tentatively scheduled for the last Monday of either March or April. Through a translator, Tang told SPR he hopes to gain the support of the neighbors, as well as the civic association, and intends on making the building an attractive addition to the community.